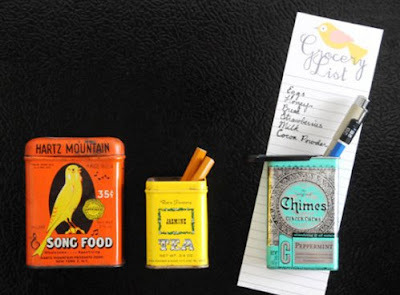 Since we were all about repurposing vintage tins yesterday, I thought this clever idea from Creature Comforts would be perfect for today's DIY tutorial and a great way to organize your kitchen and keep pencils & pens within arms reach when you need to jot down a quick reminder, recipe, or to-do list. 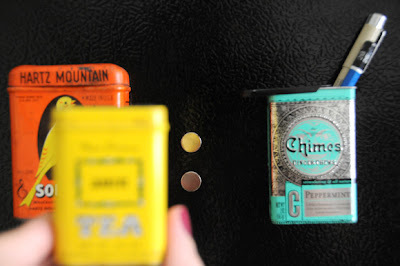 ~ Small tins (tea tins, mint tins, and candy tins are perfect). 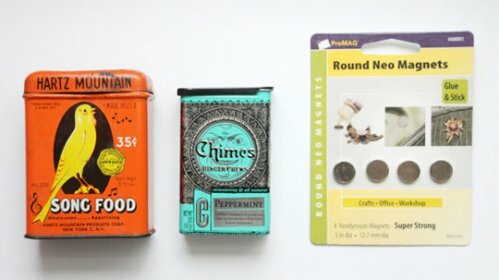 Tins that open at the top will be best for pencils, while tins with lids will work well for small doodads such as sewing pins). ~ Super strong magnets (found at Michael's or other major craft stores). You can probably find similar magnets at hardware and office supply stores. 1.) Place a minimum of two super strong magnets on your fridge or any metal surface you would like to use. A metal knife rack (for instance) can be used in your craft room to hold scissors, and tins filled with pins + notions. 2.) Take your tin of choice and attach it to the magnets. No gluing needed. The magnet with hold it in place for as long as you'd like. That's it! Fill with pencils, or whatever odds and ends you'd like and enjoy!